Pick- up by a NAC Maruti Van from Bagdogra Airport to be taken to Darjeeling (7100 Ft), the "Queen of the hill stations" , its name derived from "Dorje-Line" which means the place of "Dorje",the mystic thunderbolt. Covering a distance of 88 kms over a drive of 3.5 hrs along winding roads ,its an experience of unforgettable beauty. Check in at hotel. Start the day at 4am with an early morning trip to Tiger Hill (7800 Ft) to catch the sunrise from behind the majestic Kunchenjunga range. On the way back visit the Ghoom Monastery & Batasia Loop. Back to the hotel for breakfast. After breakfast proceed for a half day sightseeing of the Himalayan Mountaineering Institute, Zoo, Tenzing Rock, Labong Race Course, Tea Garden, Tibetan Refugees Self Help Centre & Rope-way. Back to the hotel by 3pm. Take a walk to "Chowrasta" the centre point of the Mall area. Overnight at hotel. Proceed by 8am to Pelling (6800 Ft), a 72 kms drive taking 4 hours via Jorethang to the Land of the Pristine and unspoilt natural beauty - Sikkim, with alpine landscapes and thick luxuriant forests, rivers in torrent and peaceful lakes. Arrive at Pelling & checkin at Norbu Gang Resort. This is one of the closest points to the Khanchenjunga range & one can see it upfront touching the sky from Pelling. Checkin at your hotel, relax a while then proceed to The Pemayangtse Monastery (7021 Ft), 2.5 kms from Pelling. Built during the late 17th century, it is one of the oldest & most important monasteries of the Nyingmapa order of Buddhism in Sikkim. Even today, it is only the monks of this monastery who enjoy the title of 'Tasang' or pure monks. The monastery follows the Mindroling tradition & has 108 monks. The main attraction of the monastery is the wooden replica of Zangdog Palri , the celestial abode of Guru Padmasambhava, built by Serdup L Dorje Rinpoche in 1971. Back to the hotel for an overnight stay. 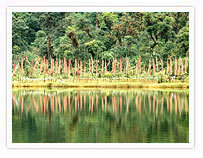 Leave early for the Khecheopalri Lake, also called the "Wish Fulfilling Lake". It lies in a depression surrounded by prayer flags & forested hills. Then to Yuksom (5800 Ft) . 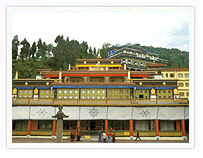 This is the first capital of the Kingdom of Sikkim & the coronation site of the first Chogyal. Evidence of the enthronement ceremony can still be seen in the form of stone seats and the footprint of the Head Lama on a stone. The stone throne constructed for the great event stands today at Norbugang which has been declared a Heritage site. If you have the time & energy, trek up to the Dubdi Monastery at Yuksom. This is a 30-35 mins trek into the forest negotiating steep slopes. It was built in 1701 after the consecration ceremony of the first Chogyal. It is an ideal place for Lamas seeking meditation and recluse. Dubdi means "the Hermit's cell". On the return stop to see the Khangchendzonga water falls. Back to the Resort by evening. Depart by 8am for Gangtok (5500 Ft) for a 4 hour journey (112 kms) via Ravangla (6800 Ft) , a small township & transit point to various destinations in South & West Sikkim, situated at the base of Meenam Hill (10300 Ft). A visit to the Tibetan Refugee Settlement Camp just above the town which houses the Kheunpheling carpet centre where one can buy fine Tibetan style woollen carpets. Lunch at Ravangla & then a fleeting visit to the Bon Monastery at Kewzing, 5 kms from Ravangla which is one of its kind in Sikkim, a symbol of the determination of the community to preserve their religious traditions. Enroute visit the Rumtek Monastery , 24 kms from Gangtok was built in 1960 by His Holiness the Late 16th Gyalwa Karmapa & this is a replica of the original Kagyurpa Monastery in Tibet, a must see for every visitor, the seat of the "Kagyu Order" . Behind the Monastery is the lavishly decorated Karmae Nalanda Institute of Buddhist Studies which attracts students from the world over. Here one can find the most unique religious scriptures & art objects of the world. Arrive at Gangtok (5500 Ft) Check in at you r hotel and day for Relax or walk to the mall. Overnight in Gangtok. After breakfast proceed to Tsomgo Lake (12,210 Ft), a 40 km drive which takes 2.5 hrs. This lake is located very close to Nathula Pass which is the entry point to China termed as the "Silk Route & remains frozen for most parts of the year. Legend has it that the Lamas use to forecast the future by studying the colour of the lakes waters. Enjoy the surroundings, majestic snowy peaks which feed the lake and the clean fresh air. Back to Gangtok by 3pm for a late lunch. Evening free for leisure or go shopping for Sikkimese traditional handicrafts. Evening back to the hotel for an overnight stay. After an early lunch, take a half day sightseeing trip to The Handicraft & Handloom Showroom, which promotes traditional arts & crafts, a veritable storehouse of exquisite carpets, blankets, shawls in "Lepcha " weaves ; The Flower Show which contains over 200 species of orchids set amidst a beautiful landscape; Enchey Monastery- built in 1910 on the site blessed by the great tantric master Lama Drutob Karpo, known for his flying powers, this monastery houses the monks of the Nyingmapa Order of Tibetan Buddhism ; Nam Nang VP/Ropeway ; Do-Drul Chorten (Stupa) which is one of the most important stupas of Sikkim, built by the head of the Nyingma order- Trullshi Rimpoche in 1945. It contains rare details of Dorji Phupa, Holy Books, Mantras and is encircled by 108 prayer wheels ; The Namgyal Institute of Tibetology built in 1958 in traditional style, a renowned worldwide centre for the study of the Mahayana Buddhist philosophy & religion, a treasure house of rare "Thankas", statues, over 200 Buddhist icons and prized objects of art Back to the hotel by evening. 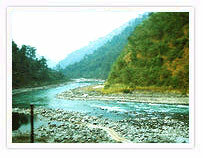 Leave the hotel by 7.30 am to reach Melli by 9am, a drive of 59kms, the starting point of the rafting on the Teesta river. The white water gushing past, a breath of fresh air, freezing water below, jutting rocks/boulders, all of it sets the Adrenalin soaring. It's a ride you will never forget. Rafting a stretch of 11 kms over a period of 1.5 hrs, a hot cup of tea greets you at the 29th Mile. 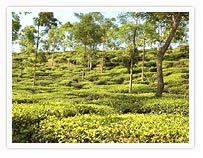 Savour the tea with some hot snacks, change into dry clothes & proceed to Kalimpong (4000 Ft) also called the garden of flowers. This town has almost everything- scenic beauty, flowers, greenery, waters, mists, clouds etc.. A drive of about 20 kms, reach Kalimpong in time for a late lunch. Check in at your hotel and day for rest . overnight at hotel. After breakfast proceed for a half day sightseeing of Durpin Hill (which has the famous Zong Dog Palri Fo- Brang Monastery which belongs to the same Buddhist sect as the present Dalai Lama) , Jelapla View Point, Pine View Point, Chitra Bhanu & Kalim Temple, Dr Graham's Homes complex with its historic church & well maintained grounds founded in 1900 by Rev. Dr. J A Graham, a Scottish missionary, Delo Hill (5556 ft) appears to be the roof- of- the- world, is the highest point in Kalimpong. Delo also has the town's picturesque water reservoir. Then on to Mangal Dham Temple constructed in memory of the late Guru Shree (108) Mangal Dasji and dedicated to Lord Krishna, Kalimpong Arts & Crafts Centre, Nature Interpretation Centre (Forest Museum). If you are in Kalimpong on a Wednesday/Saturday, walk down to the "Haat Bazaar" or local market - a place where villagers from all nearby villages come & sell/display their wares (right from handicrafts to food items). The market starts early morning by 6-7am & is on till 4pm. This is a unique extravaganza typical to rural regions, a cultural experience you will never forget. Rest of the day at leisure. Overnight at Kalimpong.